A trojan horse has been discovered that affects Mac OS X users, dubbed “trojan.osx.boonana.a” or ‘Koobface.’ An infected machine will hijack users social network accounts and attempt to spread the trojan further by sending out spam messages from your username. The trojan behaves like a worm, by trying to bait users on various social networks to click a link. 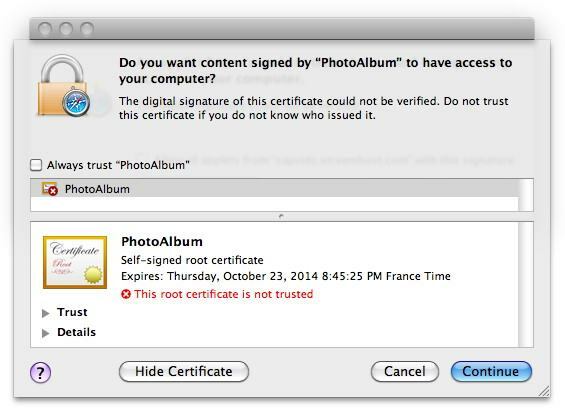 The link asks “Is this you in this video?” and, if clicked, will send a user to another website which attempts to load a Java applet, giving the user a standard Mac OS X Java Security Alert and certificate request. If the Java applet is allowed to load, it will download files to your local machine and then start a background process which attempts to propagate the trojan. You can simply click on “Deny” to prevent any further trouble, which prevents the malicious code from loading. The trojan also effects Windows users. The easiest way for Mac and Windows users to protect themselves from the trojan is to avoid clicking dubious links from untrusted sources and to deny sketchy Java applets. Another option is to disable Java in your web browser. If you are concerned that you have been affected by the Koobface trojan, you can get a free removal tool through SecureMac, who rates the risk as “Critical.” Currently the download link sends you to MacScan, but this is expected to change when the removal tool is released. It seems my Mac is infected, I got my email clogged with at least 20 ‘Mailer-Demon, could not deliver return emails. And my existing contact had an email from my address. I suspect the trojan has send emails from my id to all the contacts current and previous. The pervious perhaps explains the returns in my inbox!!! Annoyed to say the least!!! Dunno what I should do. as this has happened twice in last 4 days! There was flash installation request which I said ‘yes’ to; after a bit of hesitation, as I had a bug in my old Windows laptop! A hesitated, and then though, I got a Mac, so, it wont get infected….. it did though! Any advice would be appreciated to get the trojan out would be appreciated!!! Meh, these are not a big deal. A much bigger security breach is Firesheep on wireless networks, THAT you should worry about. OK, so it’s out there. Now if only someone had a way to remove it. A quick google search shows no way to remove this garbage from OSX. « Civilization V Release Date for Mac is November 22?